Want to bring vr to your b2b event? We've got you covered! As you plan your B2B event, it's important to consider what type of experience is going to impress your guests, draw attention to your event, create a high level of engagement, and enable you to start a conversation. We can help with all of those goals and more. We're excited to help you create the perfect experience for you and your guests. This page is designed to help you start thinking about how you would like to incorporate VR into your event by giving you a better idea of what we do. This includes a breakdown of how VR can be used to achieve different event goals, pictures of VR events, videos of VR experiences, and more. Why should you bring VR to your B2b event? What impact do you want to have on guests at your upcoming event? The answer to that question is the answer to why you should bring VR to your next event. Whatever you need, we can make it happen. Our confidence in our ability to create your perfect VR event comes from our expert VR event team, professional event execution staff, unmatched VR library, years of event experience, top quality equipment, and dedication to providing the absolute best service possible. Specifically, benefits of bringing VR to your next B2B event include (but are not limited to:) Creating FOMO (fear of missing out) in order to help you bring in as many of your desired guests as possible, establishing a VIP experience to impress your important event guests, offering a fun, unique experience that helps you get conversations flowing at your event, promoting your company as an innovative, and delivering an overall experience that your guest will love. Of course, these are just a few benefits of bringing VR to your next event, and we're always looking for new ways to help our partners create amazing experiences. Don't hesitate to reach out and we'll get started! Need immediate help? No problem. We're ready and waiting to help you get started and begin talking through what our virtual reality event partnership would look like. Click the button below and we'll be in touch ASAP. Is virtual reality right for my event? Whether your attendees are at a trade show, conference, networking event, party, or even a large industry event, we can build the perfect VR experience to match your needs. We will tailor your virtual reality experience to exactly the goal or goals you're hoping to see accomplished. Depending on the event, you might want to generate leads, drive foot traffic, draw attention to your brand, build good will, or you may just want your guests to have a really fun time, and we’re here to help you make it happen. If you're looking to create a one-of-a-kind experience for your guests, then now is the perfect time to rent VR. Competition for attention can be high at conferences. In order to attract the VIP's to you area, we can help you create a VR lounge that will truly set you apart. However, we can also focus on a booth space that drives the maximum amount of traffic to your event space. We're all about finding what works for you. At our next partner event, let us help you build connections using virtual reality. We'll help you build good will with your partners while you differentiate yourself as innovative, fun, and unique. By focusing on adding value to your next event, we guarantee to leave you and your guests happy. Trade shows are all about drawing as much attention as possible to an event space while offering an activation that engages guests. We want to ensure that you get the highest attendance possible with a VR activation that is fun, engaging, unique and completely unforgettable. We have the tools, so let's get started! VR isn't just great for drawing a crowd. We have the ability to customize in-game experiences that allow guest to actually interact with branded designs inside their virtual environment. If you're planning an event around anew product, we can help you incorporate that product into your guests' actual VR experience. If you're ready to take your networking event to the next level, then we're here to help. Whether you're planning a meeting, party, happy hour, lunch, or more, we can help you create a VR experience that draws a crowd and gets people talking. No one will want to miss your next event! We love helping bring virtual reality to community events. No matter what community you're in or what purpose your event is trying to achieve, we can help you create an experience that everyone will enjoy and that will keep the event hosts happy. Just let us know what you're thinking! We've already covered a few reasons why bringing VR to your B2B event can be a great idea. We know that you want to build the best possible event experience for your guests and we're excited to help you make it happen. That's why we work with you to to know every aspect of your event including your physical event space, the reactions you want from your guests, the level of guest throughput you're looking for, the correct VR equipment for your needs, and more. To help you start thinking through how different VR choices create different experiences for your guests, we've included some great resources below. That includes some of our favorite VR experiences, real-world examples of VR event spaces, individual benefits of VR, a mock-up of your event space, and even some feedback from our customers. Let's get started! Every VR setup is different, and we have some great examples to inspire your next virtual reality event. We can fit our VR technology to fit any event theme, help you achieve any event goals, and impress all of your attendees. We're always excited to learn new ways to fit our tech to different event needs, and we're excited to see what you have in mind! VirtualRealityRental.co is most trusted provider of virtual technology for corporate events. 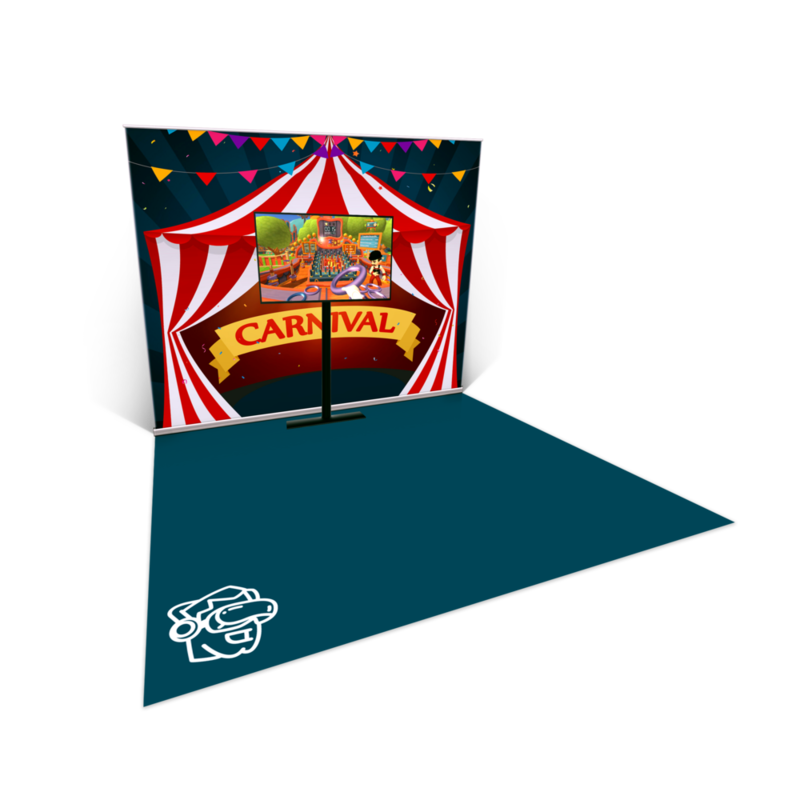 Whether you need VR for a exhibit, party, trade show, conference, meeting, or any other function, we understand how to use our VR technology to fit any event type. Our combination or cutting-edge VR equipment and unmatched event experience allow us to help build the perfect event plan for you; resulting in fun, engaging, and unforgettable experiences for your guests. There are a few reasons why we are able to promise a seamless planning process for you, and a high quality experience for your guests, and the first is our staff. Our team of experts has been working in the field of virtual reality for over 20 years, and all of our on-site technicians are fully trained in how to setup and maintain our VR equipment as well as how to professionally deliver your guests a great experience. We love events as much as we love virtual reality, and we're excited about working with you! 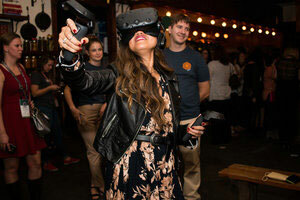 Anyone can tell you that virtual reality is a cool, new event technology, but few can actually tell you exactly how it can help you reach your specific event goals. We don’t want you to try VR just because it’s fun; we want you try it because we know it’s a profitable, engaging event activation. At VirtualRealityRental.co, we take a comprehensive look at what you are trying to achieve, and we make sure that our technology is used to deliver exactly what you’re looking for.